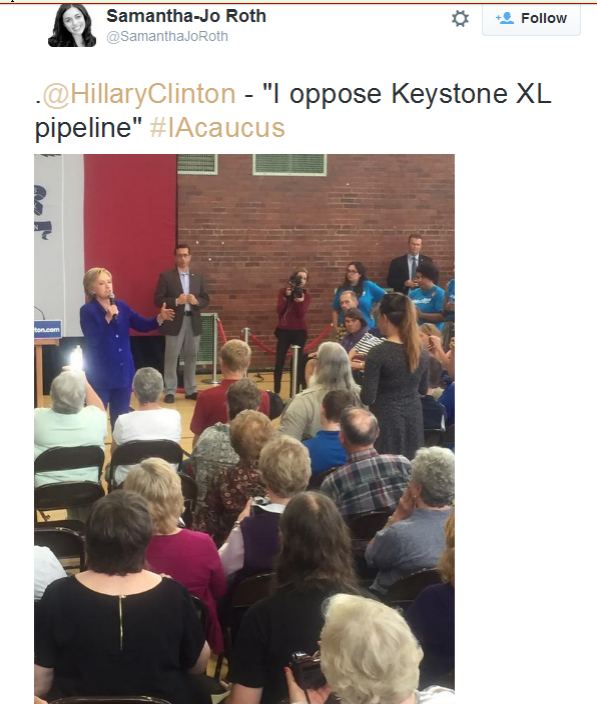 Last week Democratic presidential candidate Hillary Clinton put the White House on notice that she could not wait much longer to take a stand about building the Keystone XL pipeline. The wait is over. At an Iowa event Secretary Clinton let her view be known. Considering the non-stop media coverage of Pope Francis’ arrival in Washington, DC, this will most likely be pretty much ignored by the news media. I think the very grave difficulties that Shell encountered the last time they tried to do that should be a red flag for anybody. I have been to the Arctic, I have been to Barrow, our most northernmost outpost in the United States and I think we should not risk the potential catastrophes that could come about from accidents in looking for more oil in a pristine – one of the few remaining pristine regions of the world. While we should praise Secretary Clinton for this stand and her environmental platform that put an emphasis on renewable energy, she now needs to take a stand on the KeystoneXL pipeline. Train Wrecks: What Could Possibly Go Wrong? ust about 45 minutes before the tragic train wreck in Philadelphia, MSNBC host Rachel Maddow had this report about the potential for a nuclear disaster, the proximity to nuclear missile sites of rail lines that carry volatile crude oil. So what does the Republican led House do? They cut funding to Amtrak. I have a couple articles for your perusal this morning. Obama, in his speech four days earlier announcing that he would begin Air Strikes in Syria, also discussed “extreme fundamentalism” in the Middle East. Although he did not specify Islamists as the only fundamentalists, he emphasized the necessity of eliminating these groups and, using a combination of the idea of “American Exceptionalism” and a retread of the colonial playbook where the civilized countries (read mostly white, western) have to quell the extreme militant fundamentalists (read “savages”)in the Middle East. This was of course, his justification for invading Syria and bombing ISIS. The “Axis of Evil”, originally inspired b the Nazis in World War II, was recreated by George W. Bush in 2002 and initially included three Nation States –Iraq, Iran and North Korea –and became Bush’s excuse to invade Iraq. Under his administration, this concept was later expanded to include Cuba, Libya and Syria. The American president offered no evidence to support what we now know was slander and had much more to do with protecting US oil interests than protecting the American people, not to mention the lives of other peoples of the world. Of the original six members, Cuba and North Korea are effectively quarantined by Western-imposed embargoes, isolated from balanced international relations and development. Of the other four, Iraq and Libya, were invaded by US-led forces in the name of fighting Islamic terrorism, and have been destroyed and realigned to serve Western interests. It is no accident that Obama is targeting one of the two remaining members, Syria, while changing the stakes from targeting a specific country to the concept of “extreme (read Islamic) fundamentalism” which is much broader and not hampered by nation state boundaries blurring the lines of what is legal and illegal under international law as well as increasing the threat of endless war since it is unclear what nation state you would negotiate with to end the war. In analyzing the current crisis with ISIS, an historical analysis provides some perspective. Since the 1970’s, capitalist interests have morphed into a toxic combination of religious fundamentalism and extreme militarism to achieve their economic goals — whether that is the reawakening of the Christian-based KKK and the rise of the Patriots and Tea Party in the United States; the Evangelicals, military dictators and death squads in Latin America; the Orthodox Zionist Jews and the concept of a Greater Israel in the Palestinian conflict; or extreme Islamic fundamentalism in the larger Middle East. It is unclear why this fundamentalism has such appeal these days – maybe it’s because the world is scarier as we globalize and people want to retreat to the “good old days”, to concepts they believe will not change. Maybe it’s because fundamentalism is unquestioning and based on faith rather than reason and it makes it easier for the 1% to manipulate the rest of us. Maybe it is because religious fundamentalism is not restricted by national borders and makes it easier to rationalize the new global paradigm. Maybe it is a combination of all of these. standard prescription propecia But I would suggest it is not Islamic extremists, terrorists, drug lords, rogue states, corrupt regimes, authoritarian superpowers or Eastern Block” (the “Red Menace sans Communism)who are “the enemy.” It is the multinational oil interests, the military industrial complex and the American government and its allies who are the real “axis of evil.” It is the system of capitalist corruption, exploitation and enrichment that has put the world into poverty, conflict and on the brink of yet another major war. What’s the Fracking Problem in OK, KS & PA? At least on governor is concerned about public safety enough to appoint a commission to look into the unusual seismic activity in his state. Calling it a “matter of public safety,” Gov. Sam Brownback has appointed a committee to study whether oil and gas activity is behind the recent spate of minor earthquakes in Kansas. Expansion of the oil and gas recovery method known as “fracking” has coincided with a series of small quakes in areas that had long been seismically stable. Fracking doesn’t appear to cause the problem, but an increase in oil and gas production and disposal of waste fluids associated with fracking could be behind the recent temblors that have shaken south-central Kansas and northern Oklahoma, scientists said Monday. In Dunkard Township, Pennsylvania, 50 miles south of Pittsburgh, two of Chevron’s natural gas wells exploded last week burning for five days, leaving one worker injured and another missing and presumed dead. After the fires were out, Chevron sent a letter of apology to the residents of the nearby town of Bobtown. Included in the letter was a coupon for a free large pizza and a 2-liter bottle of soda. http://maientertainmentlaw.com/?search=cost-of-accutane-generic-version Texas’ air monitoring system is so flawed that the state knows almost nothing about the extent of the pollution in the Eagle Ford. Only five permanent air monitors are installed in the 20,000-square-mile region, and all are at the fringes of the shale play, far from the heavy drilling areas where emissions are highest. http://cinziamazzamakeup.com/?x=omprare-viagra-generico-100-mg-consegna-rapida-a-Firenze Companies that break the law are rarely fined. Of the 284 oil and gas industry-related complaints filed with the TCEQ by Eagle Ford residents between Jan. 1, 2010, and Nov. 19, 2013, only two resulted in fines despite 164 documented violations. The largest was just $14,250. (Pending enforcement actions could lead to six more fines). see The Texas legislature has cut the TCEQ’s budget by a third since the Eagle Ford boom began, from $555 million in 2008 to $372 million in 2014. At the same time, the http://cinziamazzamakeup.com/?x=miglior-sito-per-comprare-levitra-originale-spedizione-veloce amount allocated for air monitoring equipment dropped from $1.2 million to $579,000. http://maientertainmentlaw.com/?search=cheap-canada-generic-canadian-levitra The Eagle Ford boom is feeding an ominous trend: A 100 percent statewide increase in unplanned, toxic air releases associated with oil and gas production since 2009. Known as emission events, these releases are usually caused by human error or faulty equipment. Residents of the http://cinziamazzamakeup.com/?x=offerte-limitate-viagra mostly rural Eagle Ford counties are at a disadvantage even in Texas, because they follow haven’t been given air quality protections, such as more permanent monitors, provided to the wealthier, more suburban Barnett Shale region near Dallas-Fort Worth. MSNBC’s Rachel Maddow examined some of the ills of fracking and discusses the report with Jim Morris, senior reporter and editor at the Center for Public Integrity. The Koch brothers must be thrilled. Late this afternoon, the US State Department released its environmental impact study on the Keystone XL pipeline that, if approved, will carry the dirtiest oil in the world from Canada, across the US heartland to the Gulf Coast where it will be sent to China and other foreign markets. In the final review, the study concludes that the pipeline would have little environmental impact, and would likely have no significant effect on carbon emissions. This fits the criteria that President Barack Obama has said that he would need to approve the construction. The State Department had conducted two earlier environmental reviews of the project. Last March, it found that if Obama rejected the pipeline Alberta crude would go to market by rail or other pipelines. But it revisited the issue under criticism from the Environmental Protection Agency, which said the early reviews had not been broad enough. There is one more report to be released on an investigation by the State Department Inspector General of allegations that that a contractor’s review was biased because of connections to TransCanada and the oil industry. In July, Friends of the Earth and the Checks and Balances Project, another advocacy group, said they uncovered publicly available documents online that show TransCanada, ERM, and an ERM subsidiary have worked together at least since 2011 on a separate pipeline project in Alaska. Last week, Bloomberg Businessweek posted a 2010 document in which ERM lists TransCanada as a client. If true, the department would have to conduct another study. The battle to keep the grease in the ground is not over. 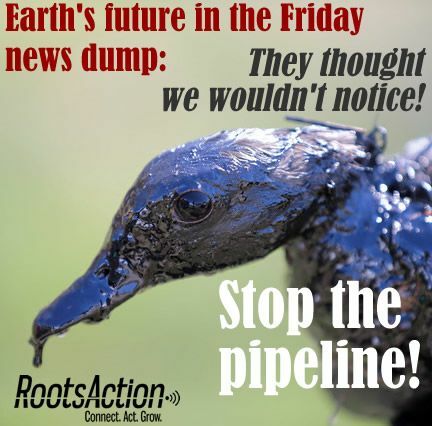 Sign the petition and tell President Obama and Secretary of State John Kerry to Protect the Earth’s Future and Stop the Keystone XL Pipeline. Our souls as well as our bodies are composed of individual elements which were all already present in the ranks of our ancestors. The “newness” in the individual psyche is an endlessly varied recombination of age-old components. Body and soul therefore have an intensely historical character and find no proper place in what is new , in things that have just come into being. That is to say, our ancestral components are only partly at home in such things. We are very far from having finished completely with the Middle Ages, classical antiquity, and primitivity, as our modern psyches pretend. Nevertheless, we have plunged down a cataract of progress, which sweeps us on into the future with ever wilder violence the farther it takes us from our roots. Once the past has been breached, it is usually annihilated, and there is no stopping the forward motion. But it is precisely the loss of connection with the past, our uprootedness, which has given rise to the “discontents” of civilisation and to such a flurry and haste that we live more in the future and its chimerical promises of a golden age than in the present, with which our whole evolutionary background has not yet caught up. We rush impetuously into novelty, driven by a mounting sense of insufficiency, dissatisfaction, and restlessness. We no longer live on what we have, but on promises, no longer in the light of the present day, but in the darkness of the future, which, we expect, will at last bring the proper sunrise. We refuse to recognise that everything better is purchased at the price of something worse; that, for example, the hope of greater freedom is cancelled out by increased enslavement to the state, not to speak of the terrible perils to which the most brilliant discoveries of science expose us. The less we understand of what our fathers and forefathers sought, the less we understand ourselves, and thus we help with all our might to rob the individual of his roots and his guiding instincts, so that he becomes a particle in the mass, ruled only by what Nietzsche called the spirit of gravity. Reforms by advances, that is, by new methods or gadgets, are of course impressive at first, but in the long run they are dubious and in any case dearly paid for. They by no means increase the contentment or happiness of people on the whole. Mostly, they are deceptive sweetenings of existence, like speedier communications, which unpleasantly accelerate the tempo of life and leave us with less time than ever before. Omnis festinatio ex parte diaboli est – all haste is of the devil, as the old masters used to say. Reforms by retrogressions, on the other hand, are as a rule less expensive and in addition more lasting, for they return to the simpler, tried and tested ways of the past and make the sparsest use of newspapers, radio, television, and all supposedly timesaving innovations. In this book I have devoted considerable space to my subjective view of the world, which, however, is not a product of rational thinking. It is rather a vision such as will come to one who undertakes, deliberately, with half-closed eyes and somewhat closed ears, to see and hear the form and voice of being. If our impressions are too distinct, we are held to the hour and minute of the present and have no way of knowing how our ancestral psyches listen to and understand the present – in other words, how our unconscious is responding to it. Thus we remain ignorant of whether our ancestral components find elementary gratification in our lives, or whether they are repelled. Inner peace and contentment depend in large measure upon whether or not the historical family, which is inherent in the individual, can be harmonised with the ephemeral conditions of the present. In the Tower at Bollingen it is as if one lived in many centuries simultaneously. The place will outlive me, and in its location and style it points backwards to things of long ago. There is very little about it to suggest the present. If a man of the sixteenth century were to move into the house, only the kerosene lamp and the matches would be new to him; otherwise, he would know his way about without difficulty. There is nothing to disturb the dead, neither electric light nor telephone. Moreover, my ancestors’ souls are sustained by the atmosphere of the house, since I answer for them the questions that their lives once left behind. I carve out rough answers as best I can. I have even drawn them on the walls. It is as if a silent, greater family, stretching down the centuries, were peopling the house. There I live in my second personality and see life in the round, as something forever coming into being and passing on. Part 1 described how humans face multiple ongoing, interlocking and spiraling crises of existential proportions, all of which can be conveniently subsumed under the theme of carrying capacity, the ability of an environment to support a population at the limit of sustainability, a limit we have exceeded. The basic elements of the story are these: Through the exploitation of fossil fuels, humans have over-run the planet, cantilevering the entirety of complex industrial society on finite sources of fossil fuels, which we are using to extract itself other resources unsustainably to the point of collapse while altering the basic chemical and biophysical operating conditions of life. Thus, the collapse of the physical environment threatens mass extinction on the order of five previous mass extinction events on Earth. This is not exactly news, yet it’s tenaciously more controversial than it should be. Today’s tour examines how we got locked into one particular death spiral, the “debt spiral,” that keeps us locked into the fossil fuel death spiral. The very recent “success” of humans in economically advanced countries has culturally engendered a misleading assessment of human accomplishment, deranged notions of wealth, and conditioned unwarranted expectations for more of the same. To borrow a phrase from Jim Hightower, industrial humans were “born on third base and thought they hit a triple.” The baptismal font of fossil fuels has fostered a belief system in which the religion is growth and the supreme being is the Lord of More, an orthodoxy that is both irrational and nearly ubiquitous in industrialized nations, and probably far more damaging than any conventional dogma Richard Dawkins has railed against. The irrationality of this system stems from the simple fact continual growth of any kind is impossible in a finite world. Despite its root insanity, this belief system has been not merely elevated as a national narrative, but has been reified as the operating system of our physical economy in the form of debt-based financing. Still worse, as the leading global power of “The American Century,” we have pushed to globalize this operating system on the rest of the world, to exert a kind of neocolonial control over resources and political systems through inventive regimes of debt and discipline, and largely succeeded. On the ascending limb of resource extraction, economic growth, and credit expansion, debt-based assets could be rolled over into the foreseeable future, and interest-laden fiat capital could function as a tradable substitute for actual resources, such as oil. The belief in infinite resource extraction has allowed debt-based fiat economies to runaway from ecological reality. As alluded to in part 1, we are hitting hard limits to physical capacity, leaving only imaginary exponential functions to vary to infinity. The master resource of oil has by any reasonable estimate begun its terminal decline, which guarantees economic contraction, which in turn certifies the impossibility of rolling all the old debt into new debt. Thus the viral proliferation of the operating system has also hit hard limits, and the ascending limb of inflationary credit expansion has transformed into its nasty alter ego of deflationary credit contraction. The American wealth pump has begun to run in reverse. How did we get here?